Retired journalist Fred A. Reed, also known by his award-winning literary translations, goes on a journey of self-discovery in his latest book 'Then We Were One.' In the book Reed questions the moral nature of childhood, criticizes the Vietnam War and gives an account of his inspirational path toward Islam. International journalist and award-winning literary translator Fred A. Reed is known in Turkey by his renowned book, "Anatolia junction: A journey into hidden Turkey," focusing on the transition from the Ottoman Empire to the Turkish Republic. He is also a three-time winner of the Governor General's Award for Translation owing to his translations from French and Greek into English. As a specialist on Middle East politics and religion, Reed has reported for many media companies such as La Presse, CBC Radio-Canada, Montreal Gazette and Le Devoir. Daily Sabah conducted an exclusive interview with Montreal writer and scholar on his latest book "Then We Were One," which was translated into Turkish last month. Reed is shocked by his brother's psychological trauma, which ended up with a suicidal death caused by the Vietnam War. As part of a self-discovery, Reed sets out on a journey that starts in South California's Mesa Verde, continues in Athens and Wairoa respectively and stops in Turkey's southeastern Urfa province where he is bewitched by Islam. The book, "Then We Were One," emphasizes the notion of illusion on nearly every page. In his monograph, Reed portrays the peaceful place where he and his brother grew up. "From the point of view of a boy, the entire world has a magical quality," said Reed to address the first connotation of innocence. As happy little boys, he and his brother were protected from any kind of danger in Mesa Verde's "geographically-protected environment with no traffic or pollution." As for the second version of innocence, Reed stated that "Parents also attempt to protect their children from any kind of danger," like my parents did. However, one way or another "the real world comes"as it happened for many people who somehow became involved in the Vietnam War. When the Vietnam War began in 1955, American men were to go into the army and support the troops within an attempt to internalize the American doctrine. Reed was from a middle-class family and he somehow found a way to delay conscription. "Without a great awareness but with a clear conviction, I realized that it was impossible for me. You can say it is a mixture of fear, disobedience, rebelliousness, conscience," said Reed. However, Reed's brother Jim went to war and was assigned as a medical photographer. He took pictures of many wounded in the war. He was an eyewitness to cuts and bruises of the American soldiers as well as to millions of Vietnamese burned and shattered. After being a witness to a crime, "not guilty of that crime but a participant in that crime," Jim had a trauma and "the feeling of the guilt worked within him and became a death sentence" that he carried out against himself. Reed comes up with a hypothesis in the book and asks how come that people were content to send their children to such a war. Referring to the death of his brother, Reed said during his book presentation at a conference in Istanbul, "I cannot demonstrate that this is true but the hypothesis is that the guilt for this death is also the same guilt that should be shared by those who carried out the war." As Reed did not want to be a part of the war directly, he left the U.S. to live in Greece and never turned back to his country where a memorial was erected in for the American soldiers who died in Vietnam. Apart from talking about the memorial of the 50,000 American soldiers who died at war, Reed also reminded that "there is no such monument in Vietnam since the death toll was in the millions. Moreover, in the Vietnam War at least 50,000 American soldiers were not killed but killed themselves. And there is no monument for them. So you can see this book as a little memorial for them." Another question to be asked is, "Why would a book about the life of somebody who grew up in North America be of any interest to readers in this country?" says Reed. The first answer should be the authenticity of the book with regards to form and content is what attracts the global audience. More significantly, it is the way book handles exceptionally complex issues such as memory, innocence, war, tragedy, hope and faith within a perfectly balanced content. Conversion narratives, especially to Islam, have been of utmost interest as a great market in Europe. However, Reed's latest is a little bit different from the traditional Western experience of Islam. While reminiscing, Reed underlined the fact that "It is not he who found Islam, but Islam found him." His life story was a happy one unlike the story of his brother. After the tragedy of Jim, Reed started ask many questions which had little answers and it took him many years to write the book. Meanwhile something also happened. And it is part of his perfectly balanced fate, "This terrible event was the end of a life, but somehow it was the beginning of a new life for me. The life I was living was no longer sustainable, so a sharp turn took place," Reed said, referring to his conversion to Islam. Reed visited Iran during the revolution several times. He studied the regime closely and wrote three books about it. What's more, he started to be curious about Turkey's agenda in the course of visiting Iran repeatedly. 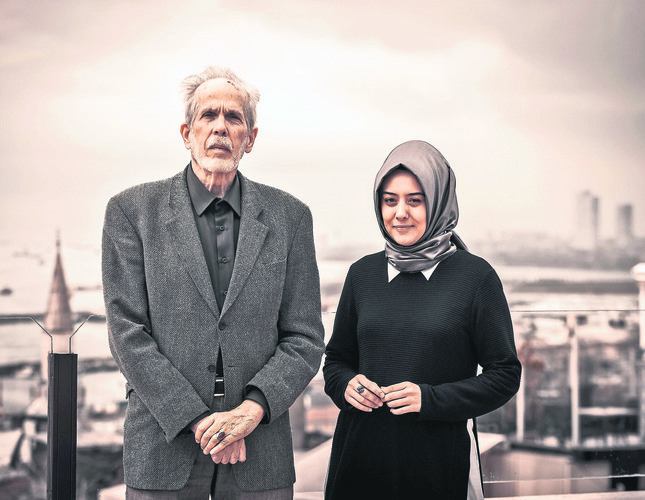 Afterward, he indirectly met Said Nursi, a Kurdish Sunni Muslim theologian, having left Turkey, by reading some of his books and from then on "The future which had been cloudy became sharply defined," for him. By and by, he met some socially committed and struggling Muslims who never told him to convert to Islam. They instead made themselves "attractive by their conduct." And later on Reed embraced brotherhood, one of the key concepts in Islam, in the absence of his brother. After such a series of ups and downs, Reed's latest book came out not as a challenge to divine authority, but as an effort to find some of the actual that factors made him who he is. Over all, when asked to depict the four main settings of "Then We Were One," encapsulating his life story, Reed expressed that "Mesa Verde is early in the morning on a clear day; Athens is a late morning, bright and warm; Wairoa is very late in the day and night is about to come; Urfa is something else, it is the following day."